As our cities grow in both density and population, how can we ensure our parks and open spaces keep pace? 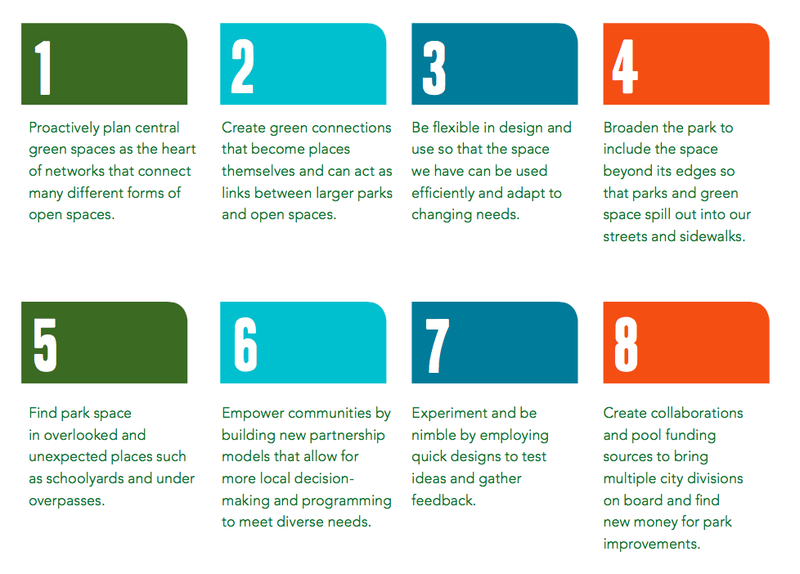 Just over a month ago, Park People, the charity where I work, released a report called Making Connections which explores this question by proposing strategies for planning parks and open space networks in urban neighbourhoods. It’s exciting to see that it’s been downloaded over 7,000 times since then. The report grew out of the idea that in today’s built-out and intensifying urban neighbourhoods, particularly in hyper-dense downtown cores, meeting the parks and open space needs of people necessitates a shift in thinking about parks as individual spaces to understanding how they fit within a wider system of open spaces in a city. This doesn’t mean relegating traditional parks to a lesser role, but rather taking advantage of a variety of spaces to build a more connected system overall that serves multiple needs–places for green respite, social gathering, play, recreation, etc. These include our streets, sidewalks, and laneways, but also hydro and rail corridors, beaches, ravines, trails, schoolyards, and any number of other publicly accessible spaces. When the report came out, an article in the Toronto Star referred to this as the “parkification” of the city—a term I really like. Acting on this shift requires a focus on making connections—connections between different kinds of open spaces, between communities and those spaces, and between city departments, outside groups, and resources. Understanding the elements of that shift is what the report is all about. While much of the report is rooted in Toronto, the guiding principles we outline look at examples from across North America to lay out a planning framework. We spoke with community members, designers, planners, developers, and business folks in Toronto, but also other cities like San Francisco, Montreal, Vancouver, Seattle, and Minneapolis. You can read the full report here, but I’ve outlined the eight principles below in shorter form and included links to more info on the case studies. 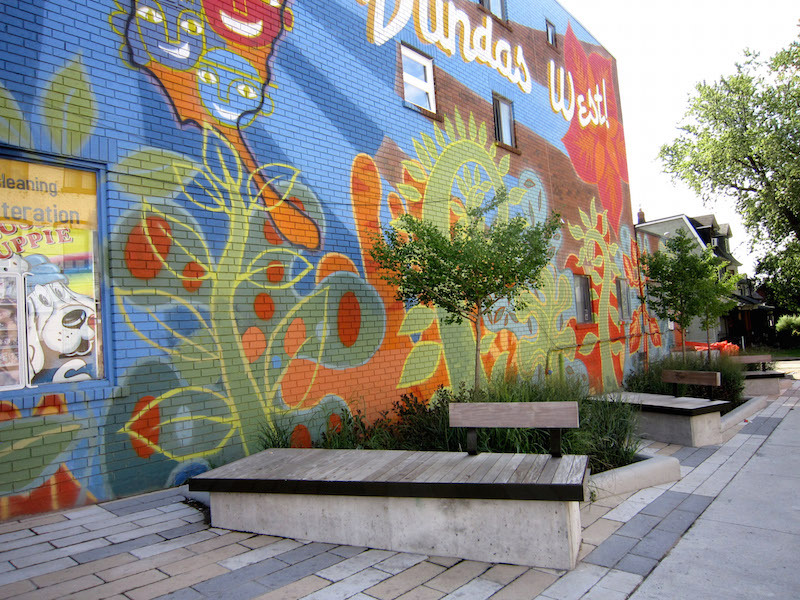 In Toronto we have avenue and corridor studies, urban design guidelines for different neighbourhoods, heritage studies, and a number of other planning documents, but what we don’t have many of are neighbourhood-scale parks and open space plans. It’s crucial to have these plans in place not only so communities can articulate a shared vision, but so development can contribute to this vision over time. Otherwise you’re left being reactive, which means the city risks falling behind or making the wrong investments. The most exciting plans look at the whole range of open spaces—from streets to schoolyards to parks—to understand how existing and new spaces can work better as a system by building connections between them. Ideally, a plan would come with a programming element as well as physical space element, laying the groundwork for future community partnerships to animate and bring these spaces to life. 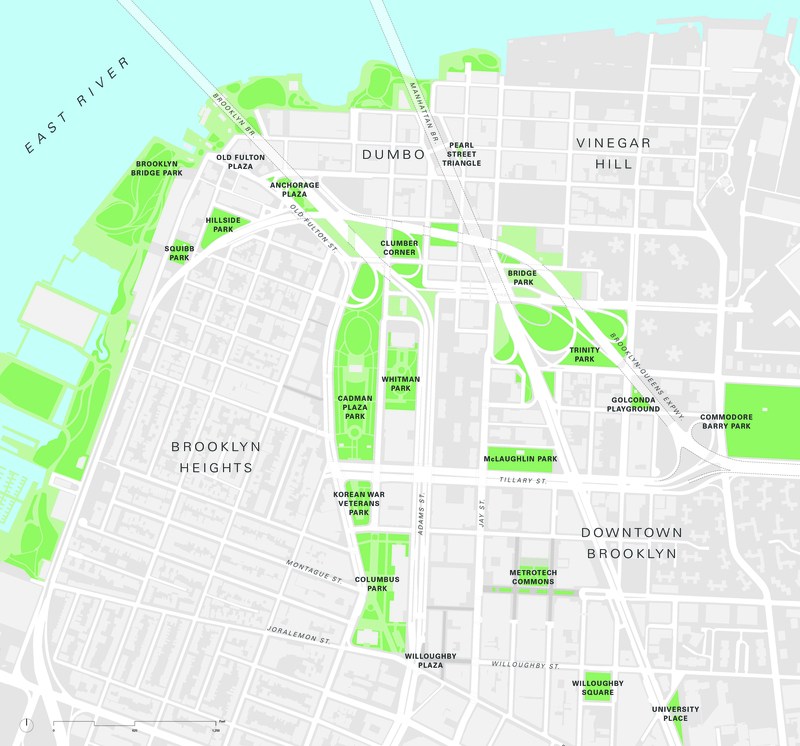 Obviously thinking about connections between open spaces is important if you’re talking about a connected parks and open space network, but it’s important that these connections aren’t just links from point A to point B, but also become places themselves. Vancouver’s Comox-Helmcken Greenway is a great example of this. It links several parks through Vancouver’s downtown neighbourhoods by creating a safe and pleasant route for walking and cycling. But it also creates small gardens and seating areas by bumping out the sidewalk space along the route, helping to pull the park experience through the street so it becomes a place to linger as well as move through. Laneways are also a great resource for creating green connections, with San Francisco, Los Angeles, and Montreal all looking to this more fine-grained network as a source of park and social gathering space. When you have a very built-out city, space becomes a scarce commodity, so many cities have begun redesigning spaces to become more flexible so they can adapt to changing uses and needs for different times of day or year. This could mean building a central gathering space that can be flooded in the winter to become an ice rink or simply using movable street furniture or even stages to allow for flexible programming. It can also mean rethinking park edges by redesigning streets that surround a park so that they can easily become part of the park when more space is needed, such as for events or in warmer weather. The new design for Toronto’s Berczy Park, for example, proposes to redesign an adjacent street to this small triangular park into a curbless tree-lined space with distinct paving so that the park edge blends more with the street. 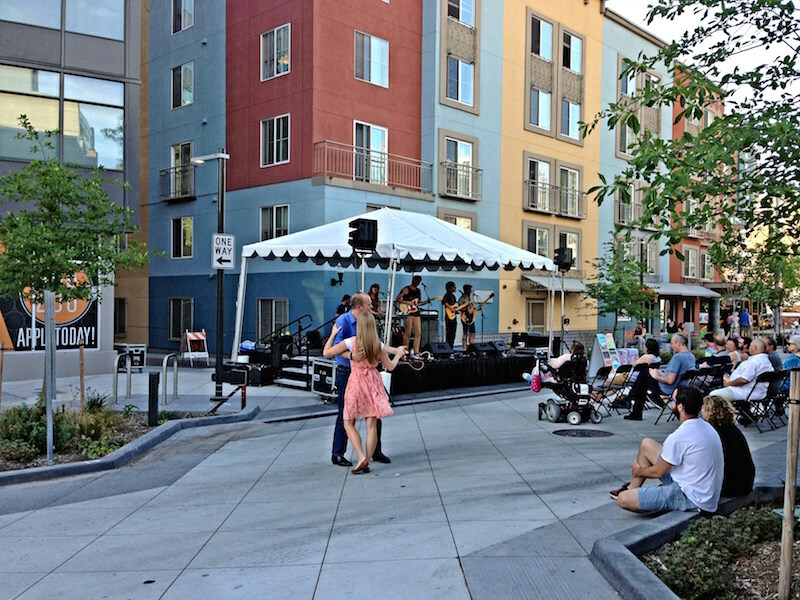 Or an existing street can be redesigned as more park-like with a flexible design that allows it to shift between being a shared street and being a plaza, such as Bell Street Park in Seattle. 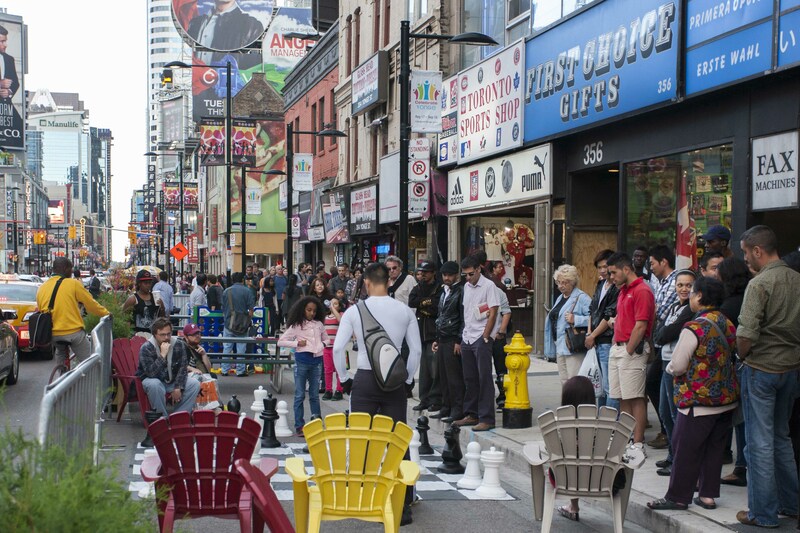 Often the largest amount of public space in a city is not its parks, but its streets (in Toronto street space takes up 22% of the city, while parks account for about 13%). So it makes sense then that many cities looking to shore up their open space system are looking to the land they already own in the public right-of-way. These can be both small spaces along boulevards or in parallel parking spaces (the trendy “parklet”), but it can also mean creating new, larger plazas or parks out of streets, as Toronto has done on two downtown university campuses that wanted more outdoor social gathering space for their students. 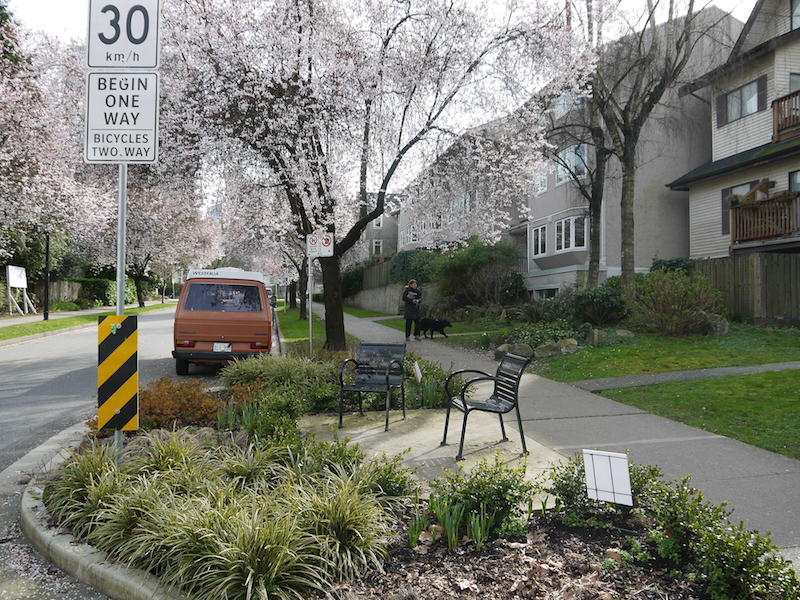 Vancouver also has a history of using traffic calming measures as opportunities to create new “mini-parks” with the city’s West End neighbourhood being the best example of how these are done. Even creating small spaces can have a large impact. Aside from the space within streets, cities are also turning to other spaces to see how they can fit into the park system. Certainly, we’ve seen the repurposing of infrastructure corridors as linear parks, with the High Line in New York being the prototypical example (but there is also the 606 in Chicago and the Green Line in Toronto) and the building of parks underneath overpasses and elevated rail lines (see Miami’s Underline proposal). But there’s also schoolyards, cemeteries, and a whole host of other spaces that are taking on more “park” roles. Peter Harnik’s book Urban Green is a great resource that dives into each of these categories in detail. The gist is that we can expand what we think of as parks by understanding what function they serve or what need or desire they fulfil within the community, whether that’s simply a green space to walk your dog (cemetary) or a place to take your kid to play (schoolyard). A big part of creating a more connected parks and open space system is connecting communities within that system by building partnership models that allow communities to have an ongoing role in the programming and stewardship of their local parks. 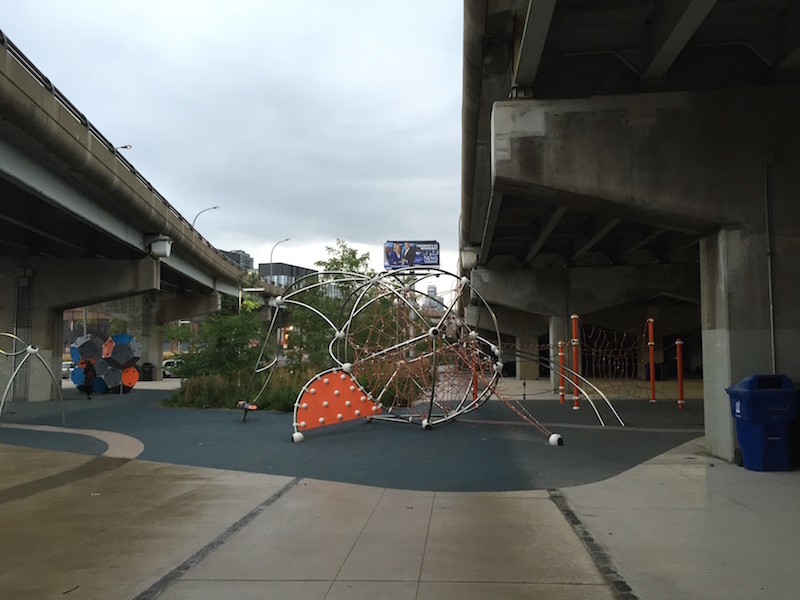 This can happen at a variety of different scales from informal park friends groups (we have over 110 in Toronto in all corners of the city) to more formal partnerships between the City and a group to operate, program or even maintain a park. 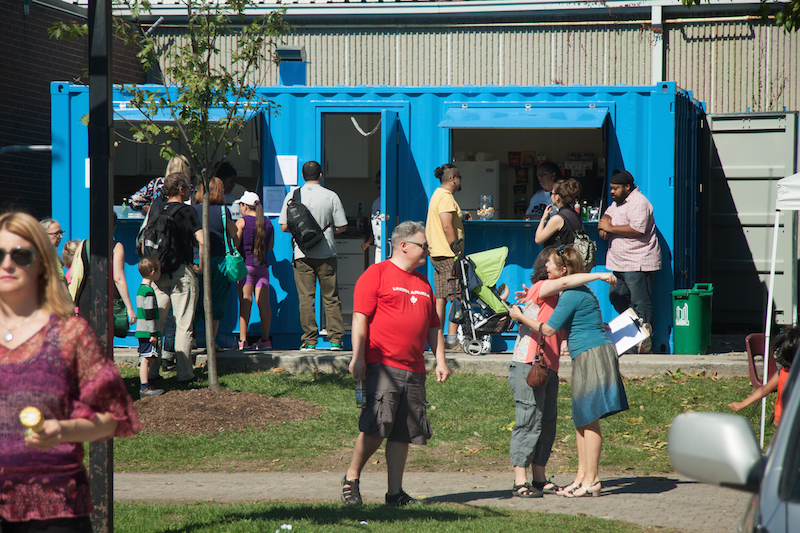 The crucial point here is to create partnerships that allow many different people to come together and contribute in a meaningful way, test out new ideas, and offer the kind of locally-responsive programming that can only come from people who live in and know the neighbourhood–like a tandoor oven built in a park. Finally, we come to the need to think across sectors and city departments to implement some of these ideas and find new sources of funding for parks and open space projects. 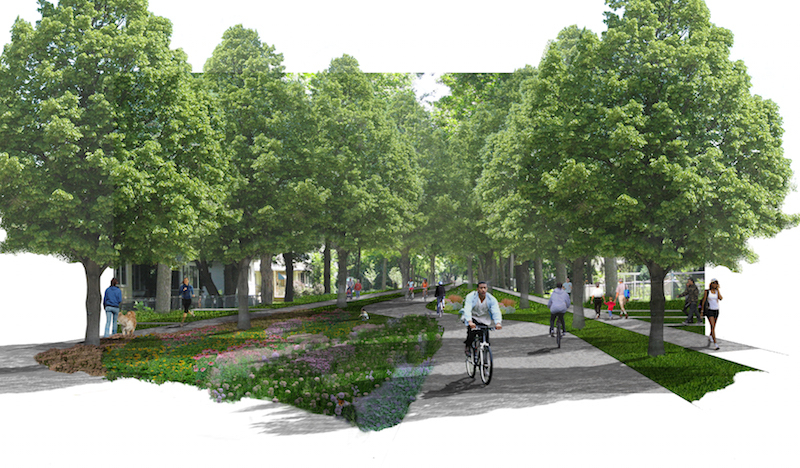 Sometimes this funding can be health-related, as with the planning work being done on the North Minneapolis Greenway. The point is that a more connected parks and open space system crosses departmental boundaries and necessitates collaboration between parks, transportation, public works, water, public health—not to mention outside non-profit groups and community members. Toronto’s green streets pilot is a good example, where a green infrastructure project grew out of a request from the community to make an intersection safer. As a result parks, city planning, water, and transportation are all working together to create a new green space with seating that achieves both the transportation goals as well as helps to manage stormwater onsite. If you want to read more, check the full report.